Books are great as they impart knowledge to us but did you know that they work very well as an accessory in your home decor as well? 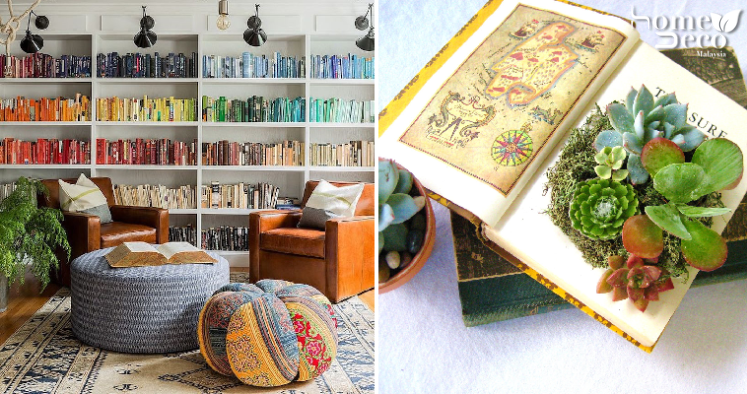 Now you don’t have to throw away any old books that you don’t want but can use them to decorate your home as well. Here are some cool ideas for you. If you have any old books lying around and you don’t know what you want to do with them, you can consider reusing them to create a totally unique wallpaper for your home. That way, your old books won’t go to waste and you will be making a statement wall in your home. This one is for the bookworms who have plenty of books at home as they would be able to create this beautiful decor at home. It works best if you are super organised as well but it’s really easy to do as all you need to do is arrange the books according to colour for an eye-popping look. Although there are many specialised coffee table books out there, putting your own favourite books on the coffee table is a different aspect. Not only will the books be within easy reach, but you can add visual appeal to your coffee table as well. This is another great idea to upcycle your old books and give them a new lease of life in your home as a decor item. One really awesome way to do so is use it as a planter like this or even as a photo frame if you wish to do so. Awkward corners in your home can be really hard to decorate but you can do so easily with some of your book collection. If you have the budget, build a custom floor-to-ceiling shelf so that it won’t have any empty space.